Choosing a list of Top Ten Castles in fiction for the Guardian was huge fun: hours spent curled up on the sofa reading through piles of children’s books, demanding regular cups of tea and claiming that this was serious work. To be fair, there are a great many books with castles in, and they all needed checking. Castles are everywhere in fiction. But why? In stories, castles are shorthand for importance and wealth. Something has to be quite significant before you need a castle there to defend it, and you have to have rather a lot of money before you can think about constructing such a building. So castles have automatic associations with power and riches, which are mysterious and intriguing to most of us, whether those are current at the time of the story (always good), or long decayed (sometimes even better). Big, important things happened in castles. But at the same time, castles were homes, so we have an immediate sympathy for the people who lived in them. No-one can walk through the remains of a castle and not start speculating about the domestic details (“Kitchens, that far from the dining hall? Awkward.”) They are strange and yet familiar, and that is why they are so fascinating. Well, not just ours – more of a brilliant idea to encourage people to try books from independent publishers. 21 March has been declared indiebooksday. The pitch is – buy one, take your photo with it and post on social media. If you haven’t come across it before, it kicked off in Germany in 2013 and gets bigger each year, with more publishers on board and more people involved. We’re celebrating Indiebooksday with a special promotion – post a picture of yourself with one of our books, post it to some social medium or other, and email us a link between now and the end of the month and we’ll send you a voucher for any of our books at half price and free delivery. Don’t have one of our books to hand? Treat yourself at indiebooks.co.uk. It’s not just the sun that’s about to go away for a bit. Not wanting to disappoint future readers, we’re now thinking of bringing WWW back next year in a new format, and perhaps with some additional content, so watch this space. 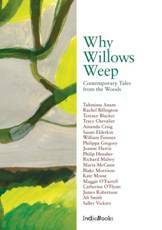 Meanwhile, Why Willows Weep is still available as an e-book for the Kindle. Our v ery own Jessamy Taylor is featured today in the Guardian talking about the top ten castles in fiction. Her eclectic selection ranges from the Château d’If in Alexandre Dumas’ ‘The Count of Monte Cristo’ to the Schloss Adler in Alastair Maclean’s ‘Where Eagles Dare.’ There are a couple of forgotten favourites in there too, and ones we’ve never heard of and now want to track down. Well worth a read. And afterwards, why not compare to the castles in Jessamy’s own King’s Company?